Community Spotlight: Jessie Zapo | Brooklyn Running Co.
Jessie Zapo is a remarkable figure within the NYC running community. She first joined The Bridge Runners in 2005 before becoming a founding member of The Black Roses NYC and starting her very own Brooklyn-based group: The Bkfastclub. You can follow her on social media @JessieZapo or on her website at jessiezapo.com. Her photography, much like her story, is both powerful and inspiring. Check out our interview with Jessie below. Describe the change in the NYC running scene since you joined it in 2005 – what was the club scene like, what kind of community was there surrounding the sport of running, and what is the current state like today? In 2005 when I first started running with a group (the Bridge Runners) there were only a handful of people who ran with them, at times it was very intimate. It was a unique experience, running in the dark with people who didn’t look like your idea of what a “runner” was supposed to be…and who encouraged new people to join them. We ran off the beaten track, over bridges, through back alleys and all sorts of neighborhoods not normally traversed. My experience of running before that was usually running the loop in Prospect Park by myself during the daylight hours. I would see the same faces in the park, but runners were there doing their own thing. Sometimes you might get a head nod of recognition from another familiar face, but the experience was primarily a solitary one. I had never seen another running group that looked like us at that time. There were other running clubs who ran competitively and you might see them at races, but otherwise we were anomalous. At that time I couldn’t get people to come run. Friends would politely or impolitely let me know that they would definitely NOT be spending their time running around in a group. Some friends even went as far as to be concerned about this new “obsession” that I had developed. Truth be told, many people thought it was crazy weird. But still this little underground group of downtown runners began to grow. It certainly attracted people who were intrigued and not intimidated. 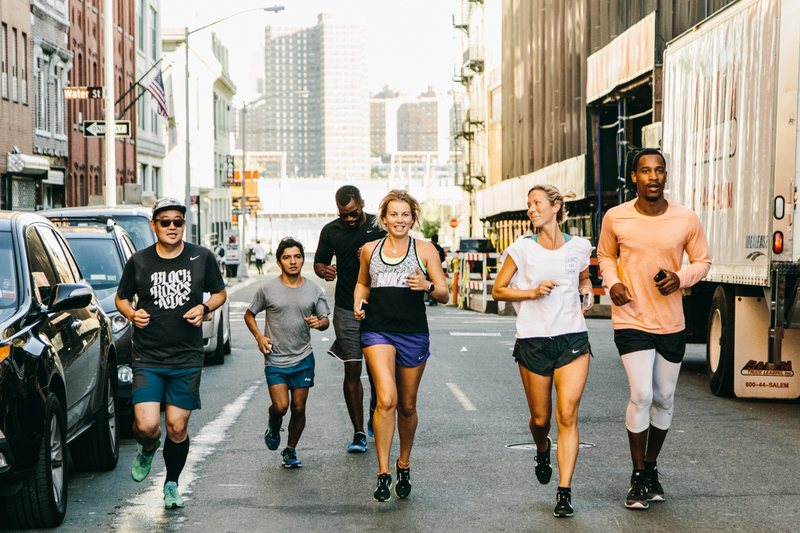 It began to make a space for a new type of runner—a social space that was in many ways gang-like and was also full of creative people who began to promote the idea of running crew “lifestyle.” Now ten years later there are many running crews and clubs all over the world and in particular New York is full of them. Once people realized that they could start their own run club—they began popping up everywhere as the trend of running, fitness and healthy living became the norm. I think social media played a huge role in connecting people and ideas about running and helped clubs or crews to promote their own styles. Someone recently put together a listing of “urban run crews” and listed over 200 in existence that they had found. 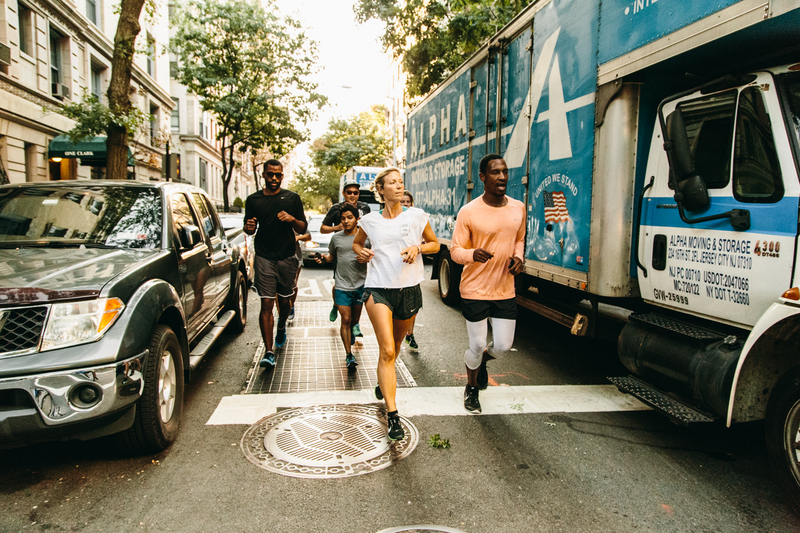 In New York different run groups seem to be really reflective of not just the neighborhoods that they run in, but also the group leader(s) particular style and approach to running as well. We are definitely in the midst of a running boom, and I think that’s cool. Is there a palpable difference between NYC running within Brooklyn versus Manhattan? Of course there are differences in neighborhoods and vibes between Brooklyn and Manhattan. It’s nice when you can throw some bridges in a run and be able to incorporate both boroughs in one run. Even adding in Queens can be cool. What’s cool to me is seeing the transitions between neighborhoods while running. If you stay in one place (like a park) that can be great training, but can also be kind of redundant and even injury producing if you’re not mixing it up. I’m convinced my first running injury (back in 2005) was from running the prospect park loop too often and too repetitively. There’s more running paths for people (even bike lines!) than there were ten years ago, so now you are not limited to the parks. We always ran in the street in Manhattan, which gets a little gnarly with traffic and stopping (or not stopping) at streetlights. In Brooklyn because it feels more spread out and sometimes quieter streets, you can actually run on the sidewalk in places or on a quiet bike lane. In Brooklyn I run early. In Manhattan I always ran at night. My experience is specific to me, and the lifestyle that I have had over time…so I’m sure its relative to where someone lives, where they run, how they run, who they run with and their style of doing so. Where’s your favorite place to train in NYC? My thing is that I have always loved to use running as a tool for exploration. So it’s hard to say that there is one favorite place of mine to run. However, that being said, I love to run the waterfront in Dumbo, I love running to Red Hook and I also regularly use McCarren Park Track for workouts in Williamsburg.You’ve been very involved in NYC’s club scene and are a founding member of the Bkfastclub. What is the mission of that group and your “Girls Run NYC” group? Bkfastclub is a morning run that I started with a friend in 2013 during the off-season of another project that I had been working on called Black Roses. Bkfastclub started as a reason to get up early and get a few miles in plus a lot of talking and some coffee with friends. We started it in Clinton Hill so that it was central between some friends who lived in Bed-Stuy and Fort Greene could meet up on the corner. It picked up some momentum as other friends and neighbors joined in on runs, but mainly also loved the experience of hanging out and drinking coffee after. The group runs 3 times a week in the a.m. and members connect with each other through a whatsapp group as well as a weekly email blast that we send out with run info. Our motto is “keep it casual” and we try to promote conversational pace running so that folks are interacting and not racing. I started Girls Run NYC as a women’s only run that I host weekly to create a gender specific space for women to run and train together. I started with weekly long runs last winter/spring and led a training group for 20 women, who trained for 12 weeks and traveled together to race the Nike Women’s 15k in Toronto last June. In July we transitioned into weekly track workouts after getting my USATF coaching certification this year. 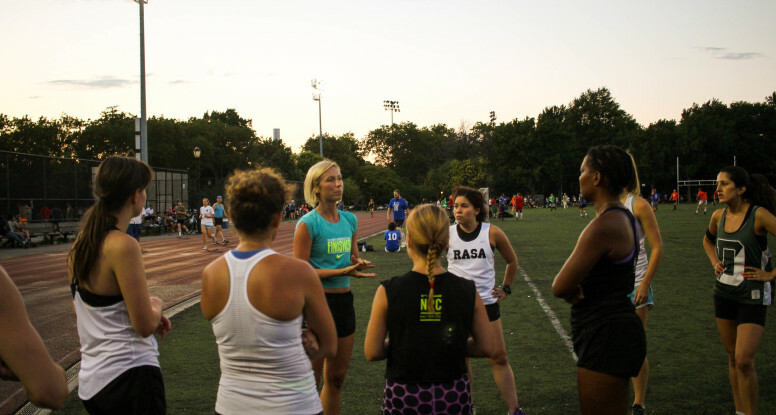 The past 6 months I have been hosting a women’s track workout in Williamsburg on Wednesday nights. It has been an opportunity to bring women together across various running crews/groups, and provides a supportive space for collaborative efforts on training, community building and life. Girls Run NYC has been an organic project that has been exciting for me to shape and watch it evolving and growing. I am really excited for 2016. Social media has played an incredible role in sharing running stories and memories. It seems we can’t get through a workout these days without stopping to take a pic to memorialize. Has the pendulum swung too far? Where does it go from here? Social media has been amazing for projecting running culture. I first started really using social media (in particular Instagram) in late 2011 to document the happenings of running with Bridge Runners. Then when starting Black Roses in 2012, we wanted to use social media to tell a unique (now ubiquitous) running “story” and share lifestyle/training/culture around this scene with the world. I think people got really creative, and then some things got really stale at the same time. Some people went to print media, which is cool. The question was always how to keep it fresh, interesting, cutting edge. Once the edge or interest is gone, then I guess it’s time to re-invent again. Or go back to basics. In the end, it’s always just been about running. So if you’re about the running, the other stuff will fade and you will keep running. Time to write books. 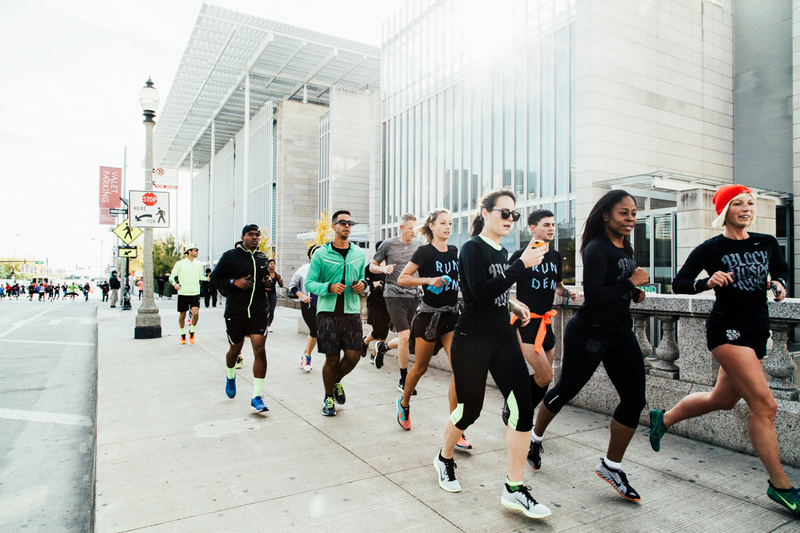 Where do you see the running scene evolving from here now that there has been such a huge proliferation of clubs andcrews and the brands have gotten so actively involved? Has it lost its edge, it’s cool factor, a bit? Again, if you’re about running for real the scene doesn’t matter that much. It will evolve. It has evolved. We’re already in the third generation of “urban running” in my estimation. If I can, I will make running last forever. That has always been my goal—sustain myself as a runner. Give others the gift of running. Help others learn how to sustain themselves, evolve, try to be their best selves. Running has always been around. It’s not going anywhere. If it’s too pop, then we go back underground.